The UK medicines regulator destroys detailed information on the benefits and harms of medicines it has approved after it has held it for 15 years. This means that for medicines which have been on the market for longer than 15 years, which is the majority of them, the Medicines and Healthcare Products Regulatory Agency (MHRA) no longer holds the data it based its licensing decision on. Whilst researching Hudson’s GSK career on the web I came across these two very interesting articles. Since this blog was set up 6 years ago in order to document the Seroxat Scandal- and all that it entails -it seems Ian Hudson might be a major player in unravelling the truth about Seroxat- therefore some coverage of him is entirely warranted. I would realy like to know what he knows about Seroxat… What was his role at GSK? Did it involve Seroxat? Does he know what GSK have hidden in their Seroxat files? As the previous head of “Global Safety” at GSK and now the guy responsible for safe-guarding the UK public from potentially harmful drugs such as Seroxat and Avandia how does Ian Hudson reconcile his conscience when a drug he once defended has been proven to kill? What was his role in all of this way back when he was working for GSK defending Seroxat in court cases in the US? As CEO of the medicines regulator, is he on the side of patients or the pharmaceutical industry? IS THIS THE RIGHT MAN TO HEAD SEROXAT INQUIRY? A City MP is demanding to know why the UK is being represented in a European review of the antidepressant drug Seroxat by a man who used to work for GlaxoSmithKline (GSK). Parmjit Dhanda, MP for Gloucester, is asking the Government why they allowed Dr Ian Hudson to take part in the European Medicines Evaluation Agency (EMEA)’s review of Seroxat. As well as working as worldwide safety director for GSK – the manufacturers of Seroxat – from 1999 until 2001, Dr Hudson acted as witness for the defence in a trial in which Seroxat was accused of triggering a man’s violent and suicidal behaviour. But the Government’s Medicines and Healthcare Products Regulatory Agency (MHRA) says it is satisfied Dr Hudson’s previous links with GSK will not compromise the review. They say he will not be allowed to participate in Seroxat discussions during the review. Mr Dhanda said: “I am really determined to get to the bottom of this. “We need to make people aware that there are representatives involved in this inquiry into the drug who have worked with GSK in the past. Mr Dhanda yesterday tabled four questions in the House of Commons demanding answers from the Secretary of State for Health, John Reid. Earlier this year, a UK review into Seroxat was disbanded after it emerged many of the members held interests in GSK. Alongside another representative from the MHRA, Dr Peter Arlett, Dr Hudson is part of a team of 30 experts from across Europe who are evaluating the safety of Seroxat following concerns raised in the UK and in the United States. The experts, who began their review in June, hope to announce their results by the end of this year. According to the EMEA, there are four possible recommendations to come as a result of their review – no action, change advice about the drug given to doctors, suspend the drug or withdraw it altogether. Their recommendation will then be passed to the European Commission who will then make a final decision to be implemented throughout Europe. GSK maintains that Seroxat – now the company’s best selling drug – is an effective treatment that has helped tens of millions of patients worldwide to lead fuller and more productive lives. The appointment of Dr Hudson has angered Seroxat users in Gloucestershire who still hope for a full independent inquiry into the drug they claim has destroyed their lives. Faye Elliott, spokeswoman for the Gloucestershire Seroxat Support Group, said: “Knowing that the European decision will be final, it is very worrying for the thousands of us who are still suffering with either side-effects or withdrawal symptoms from this drug. But the EMEA remain confident of its ability to reach a fair conclusion. Mr Wadhion said: “We ask all members of our committee if there is any potential conflict of interest that we should be aware of. A spokesman for the MHRA said: “The Government actively encourages interchange between the Civil Service and industry, but takes care to ensure that there are no conflicts of interests. In my last post, Psychotic doubt, we saw the most successful maneuver that has ever been devised for hiding dead bodies and silencing us when we are injured. We saw a mechanism that acts like the authority of a psychoanalyst (when Freud was still in vogue), or an ecclesiastical authority (until recently), to silence dissent and cause someone who has been abused to doubt their sanity and blame themselves for something done to them. This mechanism that allows companies, regulators, and academics to hide dead bodies by an appeal to evidence that in actual fact shows an increased risk of death on treatment is not just psychosis-inducing; it also has a Burn in Hell component to it. This is how it happens. Here is Ronald Krall being deposed in 2007. He is the head of Global Safety at GlaxoSmithkline. Q: Are you willing to tell the jury under oath that you are not aware of a single side effect that is caused by Paxil? A: I am prepared to say to the jury that I am not sufficiently familiar with all of the data for all of the adverse events to tell you that there is an adverse event that is caused by Paxil. Here is Ian Hudson being deposed in 2001, then head of Global Safety at GSK, later a member of the British regulatory apparatus, the MHRA:Q. Okay. So, your view is: It’s simply impossible for SmithKline Beecham to decide whether Paxil did or did not contribute to the homicidal or suicidal behavior of any one given individual; is that your testimony?A. We would certainly gather all the information, but on an individual case basis it would be impossible to decide whether paroxetine caused an event or not… It is impossible, on an individual case basis, from individual reports, to assign causality especially in a very complicated area such as this. That’s why, when we have issues, we review all the available data and make a determination, on the basis of all the available data, whether there is an issue or not.Q. Okay. Do you believe that it is possible that Paxil has caused any person, worldwide, to commit an act of homicide or suicide?A: I have seen no evidence to suggest that at all.If there is even a small possibility the problem could have been caused by chance, then it has been caused by chance.Hudson and Krall are demonstrating the standard company approach to determining causality. In this case GSK had lots of reports of suicide, aggression, birth defects, or dependence. In many cases the doctor, or patient, or a company employee notes that the problem happened soon after the drug was started, cleared up when the drug was stopped, and reappeared when the drug was restarted. As a result in many cases a GSK employee has said the drug has caused the problem. Both men know this, but for Hudson and Krall there is still no evidence that their drug causes a problem — even when the dependence on Paxil (Seroxat) is universally recognized. Why not? For Hudson and Krall and regulators like Bob Temple or Ian Hudson (who is now a member of the British regulatory apparatus), if a clinical trial hasn’t confirmed a statistically significant link between treatment and an adverse event, then the adverse event hasn’t been shown to be caused by the treatment. If there is even a small possibility the problem could have been caused by chance, then it has been caused by chance. The refusal to do a study while events pour in that meet all the standard criteria for causality is the real Burn in Hell moment. While the company avoids doing a sufficiently large clinical trial to test out the link, there will never be any evidence that the drug causes a problem. The refusal to do a study while events pour into the company that meet all the standard criteria for causality is the real Burn in Hell moment. Thousands of reports can pour in, each making a compelling case that the drug has caused the problem, but a Hudson or Krall or Temple will feel comfortable saying under oath they have seen no scientific evidence that the drug causes a problem. Unbelievable though it will seem, lawyers for pharmaceutical companies have recently advised that company coding staff, when faced with convincing evidence a drug has caused a problem (that is, when a problem appears after the drug is started and clears when it is stopped and reappears when it is restarted), should not code this as caused by the drug as they have been doing. ‘We are attaching a copy of our current product information for Paxil… Please review the section on USE DURING PREGNANCY.Further questions about your treatment should be directed to the physician, pharmacist or healthcare provider who has the most complete information about your medical condition. Because patient care is individualized, we encourage patients to direct questions about their medical condition and treatment to their physician. We believe because you physician knows your medical history, he or she is best suited to answer your questions. Our Drug Information department is available to answer any questions your physician or pharmacist may have about our products. ‘This response is in regards to an email I sent you preciously [sic]. I was asking to see if you have any, or were in the process of any clinical trials for women who are currently on Paxil and pregnant. I wanted to find out any information on women who were on Paxil during pregnancy and if they were able to have healthy babies. I am in no way insinuating your product did this to my child. I love the product and don’t think that I could have gotten through my panic attacks without the wonderful help of this miracle drug. I just want to get pregnant again soon. I do not want to put my unborn child through anything that would hurt him/her. Please, if you do not have information, where is this information held? Does anyone do studies like this? Please any information that you may give me would be great’. The birth defects this woman’s child had suffered were coded as almost certainly linked to Paxil but neither she nor her doctor were told this. In internal company documents, the birth defects this woman’s child had suffered were coded as almost certainly linked to Paxil but neither she nor her doctor were told this. This seems eerily reminiscent of appeals by Catholic cardinals to Canon Law (an idiosyncratic take on legal significance) when asked to account for their handling of abuse cases in the Church. Deposition of R Krall, Head of Global Safety GlaxoSmithKline, 2007. Deposition of Ian Hudson in Tobin vs SmithKline Beecham, December 15th 2000, 30–33. THE Medicines and Healthcare products Regulatory Agency (MHRA) is one of those super regulators of which Labour is so fond. But while many superwatchdogs like Ofcom appear to be hyperactive, the MHRA is earning a reputation for sleepiness and lack of transparency. Nowhere has this been more obvious than in its recent dealings with GlaxoSmithKline. To its credit, the agency moved with some speed a year ago to clamp down on the use of antidepressant Paxil/Seroxat by young people after it discovered potential suicide risks. It also launched an investigation into why it had taken GSK so long to disclose a series of studies to regulators showing potential problems with Seroxat among young people. One complication for the MHRA is that Dr Ian Hudson, currently director of licensing, was worldwide safety director for GSK until 2001. This potentially raised conflict of interest problems. But until last week everything went quiet. That was when New York attorney general Eliot Spitzer launched his missile at GSK, accusing it of fraudulently suppressing research suggesting that the antidepressant was unsafe in treating young children. The inquiries on both sides of the Atlantic are of a piece. Both focus on GSK’s methods and the way it presents data to the authorities, not on the substance of whether Paxil/Seroxat can be harmful in certain circumstances. In fact, the problem is accepted by GSK which, in co- operation with the MHRA, sent out new instructions to medical practitioners last year. A comparison could be made with Shell. The problem for the oil giant this year is not just that its reserves turned out to be less than it reported to the markets, but that bosses engaged in an elaborate cover-up to prevent this becoming public. In the weekend press Jean-Pierre Garnier, GSK’s highly-paid, Philadelphia-based chief executive, fought back against Spitzer, accusing him of ‘bullying tactics’ and failing to alert GSK to what was coming. It is interesting to note, however, that Garnier acknowledged that GSK’s research record has not been perfect. Garnier and GSK cannot afford to ignore Spitzer. He is notably careful in preparing his cases and the Wall Street experience, where he brought to a head the market scandal, shows that he does not go on fishing expeditions. His cases are based mostly on hard evidence that walks through the door of his Manhattan office. A settlement between Spitzer and GSK – if that is the route they take – could open the floodgates of compensation claims from the families of young Paxil/Seroxat users. As important for the UK drugs industry is that the present cosy relationship between the MHRA and GSK – in which disputes rarely come into the open – is ended. Moreover, the MHRA falls under the heavy hand of the Department of Health, which has little experience or apparent knowledge of cutting- edge commercial and pharmaceutical issues. If it is to be an effective and trusted watchdog, the agency needs to be cut loose from government and the drugs industry. Nothing less will do to restore confidence in the approval process. The resignation last night of Richard Brook, the chief executive of the mental health charity Mind, from an expert working group on antidepressants has prompted calls for a review of the system of regulating and licensing medical drugs. Mr Brook was appointed as a lay member of the group, set up by the Committee on the Safety of Medicines last year for a thorough look at all the allegations against the antidepressant Seroxat, after years of patients’ and consumer groups’ concern about the side-effects of modern antidepressants. Some people say they cannot stop taking them, because withdrawal makes them feel so bad, others say the drugs have made them violent or suicidal. On Thursday the CSM issued a warning to doctors about the appropriate dosage of Seroxat, a warning for which Mr Brook had been pressing in the light of trial data more than 14 years old which the CSM failed to consider in three successive reviews of the drug. Mr Brook’s appointment was a departure from the CSM’s normal practices of drawing on a pool of scientists and drug experts who, with few exceptions, have or in the past had links with the drug companies, from shareholdings to research grants to their universities. All members have to declare their interests and either withdraw from the room or not vote when conflicts arise. Even so, there have been allegations of “institutional bias”. The suggestion is that the regulating authorities and the drug companies are too closely interrelated. Key figures not only on the CSM but also in the Medicines and Healthcare Products Regulatory Agency – the drug licensing body which it advises – have a history of consultancy, research or even employment by pharmaceutical companies. Ian Hudson, for instance, the worldwide safety director of GlaxoSmithKline (GSK) until 2001, is now director of licensing at the MHRA. The MHRA and CSM say that they have to draw on the expertise of a relatively small pool of highly qualified individuals who inevitably have gained their experience in the industry, but critics say it would be possible to find academics who are completely independent. One of the fiercest critics, Charles Medawar of the consumer group Social Audit, will allege in a book to be published on Tuesday, Medicines Out of Control?, that the system is dangerously secretive, riddled with conflicts of interest, and indelibly flawed by chaotic and incompetent procedures for evaluating drug benefits and risks. “These revelations [of the Seroxat trials] provide compelling evidence of the need for transparency in drug regulation. Had the evidence from these dose-ranging studies been made publicly available the regulators’ errors would have been apparent years ago,” he said. Mr Medawar is one of those who are troubled by the revolving door between the drug regulators and the pharmaceutical industry. The MHRA chairman, Sir Alastair Breckenridge, resigned his position on Glaxo’s scientific advisory committee to take up his previous position as chairman of the CSM, although he has usually left the room when Seroxat has been discussed. “For many years Breckenridge had close ties with the manufacturers of Seroxat, yet he played a key role in the regulation of that drug,” Mr Medawar said. While he was still on GSK’s advisory board Professor Breckenridge took part in the Seroxat licensing discussions, although he did not vote. The data at the heart of the matter showed Seroxat to be ineffective and unsafe at high doses. An estimated 17,000 patients were put on doses higher than the recommended 20mg last year, according to the Department of Health. Seroxat is made by GSK in 20mg and 30mg tablets. But higher doses are no more effective than the 20mg pill, and carry the risk of increased side-effects. The data on the drug comes from one of the original trials carried out to establish the effect and safety of different doses before GSK applied for a licence to sell it in 1990. Patients in the trial, which was conducted in 1985-86, were started on 10, 20, 30 or 40mg doses. Many of those on the higher doses dropped out because of the side-effects. The MHRA and CSM were given this information by the company and they licensed it for depression, with 20mg as the recommended dose. The MHRA, it is understood, did not employ statisticians at the time of the 1990 licence approval and must therefore have relied on GSK (then SmithKline Beecham) for an explanation of the data. Alastair Benbow, GSK’s head of European clinical psychiatry, said yesterday that GSK did not agree with the MHRA’s interpretation of the early study. He said the dosage study had been carried out in a way that would not be done today and that other studies, which had started patients on 20mg and then gradually increased the dose, should have been taken into account. Gradually increasing the dose was safe and some patients would benefit from taking doses of more than 20mg a day. This is an industry that has succeeded in building a culture in which even good descriptions of the effects of drugs are dismissed as anecdotes – except of course for patients reporting stunning benefits on treatment. An industry where Ian Hudson, then of GSK, now head of Britain’s FDA (MHRA), can get hundreds of reports of a problem like violence on Paxil-Seroxat and still say he has seen no evidence that Paxil-Seroxat causes any problems (See Burn in Hell). Let’s talk (a little) about Mr Ian Hudson…. The MHRA is supposed to safe-guard the public health- in particular from the dangers of defective and faulty pharmaceutical drugs and devices and also from the deception of pharmaceutical companies. Originally conceived partly because of the horrific Thalidomide crisis 50 years ago- it seems the MHRA has done little to protect consumers from many dangerous and defective drugs since then- drugs which include GlaxoSmithKline’s notorious Seroxat anti-depressant. drug, considering the millions who take it. I… like Mr Tobin… am outraged– and I have been outraged at GSK from the time I came off Seroxat over 10 years ago! I am outraged that I was lied to about the side effects of Seroxat. I am outraged that I had to suffer a severe decline in my quality of life because GSK lied about side effects, withdrawal and suicide issues for years despite 4 BBC panorama documentaries and numerous complaints by patients, their families and doctors about the side effects of Seroxat. I am outraged that the regulator is not just inept, but utterly corrupt – not to mention contemptuous of patients, advocates and consumers. I am outraged that GSK were not prosecuted despite a 4 year investigation into their misconduct regarding Seroxat killing children (and adults alike). I am outraged that I was enslaved to a drug for almost 3 years or my life. I am outraged on behalf of all those lied to about SSRI’s and other pharmaceutical drugs. I am outraged that people like Mr Ian Hudson have the audacity (utter gall, and brass neck) to sit at the top of a regulatory body which failed to protect vulnerable people from the dangers of a defective medication and a predatory, immoral and sociopathic drug company. A drug company which he himself once worked for and defended in court!.. in a case where they were found guilty!.. I am outraged that Ian Hudson (a former GSK executive) didn’t even bother to turn up to a parliamentary inquiry about Seroxat a few years ago and has consistently avoided facing the consequences of the Seroxat Scandal… I am outraged at this man’s apparent utter contempt for those he is supposed to represent! I am not the only one writing about these scandalous issues and the Seroxat Scandal continues to be a scandal of epic proportions. Ian Hudson presides over the organization which decides upon which medicines are safe and which are not- he defended the safety of Seroxat in a court of law in the US whilst working for the most corrupt drugs company on the planet (GSK). Seroxat has since proven to be one of the most dangerous drugs since Thalidomide- causing numerous deaths- by suicide, withdrawal, side effects and birth defects. Ian Hudson is apparently also a paediatrician! Surely if he is a qualified doctor specializing in children’s illnesses- he would be aware of the infamous Seroxat Study 329? A study which covered up the fact that Seroxat (Paxil/Paroxetine) drove children to commit suicide and self harm? Or how about the many thousands of birth defects in children -and miscarriages of babies which Seroxat caused for many women users -over the past 20 years? Is Ian Hudson aware of all this? Was he aware of these issues whilst working for GSK and defending Seroxat? Was he aware of this prior to his current tenure as CEO of the MHRA? Does he give a fiddlers? This is profoundly disturbing and the Seroxat Scandal is not something which will go away anytime soon. And in my lifetime I will continue to bang the drum about this – until justice is served! And Glaxo are brought to book! Well, I’d like it to be more open about one of its employees, Ian Hudson. I’ve been wanting to get to the truth since January 2005 when the House of Commons Health Select Committee questioned some senior MHRA members about Seroxat (Paxil). Here’s some background: Ian Hudson worked at SmithKline Beecham for 11 years (Glaxo 2 weeks) as Worldwide Director of Safety. He then joined the MHRA as its Head of Drug Licensing. During his time at SmithKline Beecham and Glaxo he had “significant involvement” with a number of drugs, especially Paroxetine (Seroxat) and two others. We know this because of this document – Ian Hudson Interests – which he filled in before joined the European Medicines Agency. I’ve mentioned it before, but Hudson is such an authority on Seroxat that Glaxo used him as one of their defence witnesses in the famous Tobin/Schell case (he gave evidence for Glaxo alongside David Wheadon). See below for this entry from the Seroxat Timeline. People can’t get hooked on Seroxat as they did on the older drugs such as Librium and Valium, claims GSK. For over a decade, the company line has been swallowed, along with the pills. But a court case in Wyoming, USA, has changed all that. The jury decided Seroxat – Paxil in the USA – was to blame for Donald Schell killing his wife, daughter, baby granddaughter and then himself. Enter Ian Hudson, witness for the defence and at the time of his deposition earlier in 2001, worldwide safety director for GSK. That’s Ian Hudson, now director of licensing at the Medicines Control Agency in the UK (later to become the MHRA). What did he have to say to the evidence of Mr Schell’s closest remaining family and three psychiatrists who all believed the tablets of Paxil/Seroxat Mr Schell took for just two days precipitated him into an unnatural and totally uncharacteristic murderous and suicidal frenzy? His position is that an individual case cannot tell you one way or the other – only randomised controlled trials will do. But Dr David Healy says that randomised control trials are the wrong tool to establish whether serious side effects are occurring. The way to investigate what is happening is to carry out a challenge-rechallenge trial, where people are given the drug, taken off it and then put back on. But GSK has not carried out that sort of study to establish whether or not Seroxat can make people agitated, suicidal, murderous or hooked. Nor has it carried out a randomised controlled trial. Here is a black hole. There is no proof that the drug does these things, says GSK, and because of that there is no reason to carry out trials that might decide it one way or the other. Does Mr Hudson still take that view now he is at the MHRA, which watches over the safety of the British public? “If he takes the position with the MHRA that he took at the trial, then none of us is safe with any drug in the UK at the moment,” says Dr Healy. How would Mr Hudson even be able to blame alcohol for making someone drunk? So what does Mr Hudson think? As always, the MHRA declines to answer detailed questions. The MHRA will (?) have been supplied with all the healthy volunteer data before it granted the licence for Seroxat. It doesn’t seem to have been worried then, which makes one wonder who, exactly, was steering them as to what it meant. More on Hudson here and here. The strange thing is that on the day the House of Commons Health Select Committee wanted to hear evidence from the MHRA specifically about Seroxat trial data and safety, Professor Alaisdair Breckenridge (MHRA Chairman), Professor Kent Woods (MHRA CEO) and June Raine (MHRA Director of Vigilence and Risk Management) all managed to attend the hearing. MPs had expected to be able to question Ian Hudson as well… unfortunately Dr Hudson could not attend as he had a prior engagement. The transcript of the hearing is here, read around question 783 for a flavour of how the committee and Chairman felt. In response to a Freedom of Information request, the MHRA has made public an email, download here –Witnesses for Thursday.pdf – apparently showing that Hudson’s non-appearance was agreed in a phone call between Lord Warner (government Health minister) and David Hinchcliffe (meeting Chairman) just a few days before the hearing. This email was from Neil Townley at the Dept. of Health to David Harrison – the Clerk of the committee (and copied to Professor Sir Alasdair Breckenridge. Q790 John Austin: I think it would have been useful if Dr Hudson had been here because, as far as I understand, he was at SmithKline Beecham and his department was responsible for the collection of adverse reaction information such as there was with Seroxat. Q791 John Austin: So he would have been a very key witness. Professor Sir Alasdair Breckenridge: But I have not discussed that with Dr Hudson. Q792 John Austin: So you must admit that it is very unfortunate he is not with us today? Professor Sir Alasdair Breckenridge: Well, I apologise for that, but I think there was some confusion about who was going to attend and I think the Clerk was told that this was where Dr Hudson was going to be. Why did Breckenridge reply to Q792 as he did? The email that was copied to him on Monday 17 January clearly states Lord Warner and Hinchcliffe had just agreed that it would only be Breckenridge, Woods and Raine who were appearing. For Breckenridge to say “…I think there was some confusion about who was going to attend and I think the Clerk was told that this was where Dr Hudson was going to be…” beggars belief. Well, I think there was no confusion at all. I think the Clerk was never told that Hudson would appear. I think Breckenridge was lying when he said that. I think it would have been too embarrassing to let Ian Hudson be questioned. Why didn’t Breckenridge simply say that “Ian Hudson is not here today because you, Mr Chairman, agreed his non-appearance with Lord Warner on Monday of this week”… (the hearing was Thursday). And why, if Hinchcliffe did agree the list of attendees, did he say nothing to explain the confusion to the hearing…. So, the question is just what did Lord Warner say to Hinchcliffe during their phone call on the morning of Monday 17 January 2005? Come on MHRA – let’s you and me have an open and honest discussion about this then. I’ve just flicked the following email to the new MHRA Chief, Ian Hudson. Any reply will also be made public. As I understand you are now Chief Executive of the MHRA. I’d congratulate you but we both know that I’d be lying with those congratulations given your past links to GlaxoSmithKline and Seroxat. That aside, I have to remain professional. Are you, or do the MHRA plan to reevaluate the current recommendations that pediatrics should not be prescribed SSRi’s? I ask as it has come to light that MHRA consultant, Stephen J W Evans, has recently co-authored a study where he and the other authors call for a re-evaluation of the current prescription of SSRIs in young people – Back story here. This email, along with your answer, if you are brave enough to answer that is, will be published on my blog. So, yesterday I, along with others, was invited along to the House of Commons in Westminster to hear a talk given by David Healy. If you are reading this blog then chances are you already know who Healy is, if not, check out his website and list of published books he has written on the subject of antidepressant medication and/or the corruption that exists in the world of the pharmaceutical industry. GlaxoSmithKline were used by Healy as an example yesterday, hey, they are, after all, a British company. You see, Glaxo have promised to be more transparent with their clinical trial results. Yay, big pat on the back for Sir Andrew. After listening to Healy one would suggest a cow pat on the back for GSK’s knight. It transpired that Glaxo’s announcement that they are going to be more transparent is nothing more than a good will gesture in the shape of a chastity belt. Glaxo are opening their doors to the world, they claim…but only if you have Willy Wonka’s golden ticket, only if you are prepared to jump through the loopholes put in place for the sole reason of deterring you from getting to the truth. In other words, we [GSK] have the information you need but we [GSK] have found a way in which you can’t have access to it unless you can prove that the data we provide you would make a useful contribution to scientific understanding… even then, we [GSK] would argue that the only people allowed access would be those who would show favoritism toward our company. The UK government, which incidentally has a Business Council where GSK’s Andrew Witty sits  will now have to decide whether Glaxo’s proposal is the way forward. Forgive my flippancy. We are talking about a government who fought tooth and nail not to have MP’s expenses in the public domain. Here’s the real deal folks. Glaxo have cupped the testicles of the British government. They are slowly twisting those testicles, with each twist they are threatening/bribing the UK government – let’s face it, Glaxo are the past-masters at bribing, right? The message is clear from Glaxo, either you do business our way or we will leave these shores and conduct our business elsewhere. Case in point, the UK Seroxat litigation. Glaxo have settled over 3,000 addiction cases in the US. They won’t settle similar claims in the UK because, it’s my belief, they have the backing of the UK government, a new chief at the helm of all drug-making decisions, Ian Hudson  and a UK legal system that has failed on more than one occasion to bring pharmaceutical companies to justice, not because of incompetent lawyers but because the way the system is designed to offer legal aid, or not as the case may be, to victims harmed by pharmaceutical products. Invites to the meeting yesterday were sent out to both the MHRA and GSK. Neither of them showed. GSK and the MHRA: Conflict of Interest? Ex Glaxo Employee Ian Hudson. Now in charge of the safety and well-being of the British public. Former Glaxo [then SmithKline Beecham] World Safety Officer Director Dr Ian Hudson has took over the role of Chief Executive at the MHRA. Hudson, who after leaving Glaxo in 2001, became the MHRA’s Licensing Director, responsible for overseeing the benefits and risks of drugs before they hit the market. It is unknown why Former MHRA chief, Kent Woods, whom I’ve had much correspondence with over the years, retired. Hudson, whilst working for GSK, was a witness for the defence [GSK] during the Tobin v SmithKline Beecham Pharmaceuticals. Donald Schell was put on Paxil [Seroxat]. Forty-eight hours later he put three bullets from two different guns through his wife’s head, as well as through his daughter’s head then through his granddaughter’s head before shooting himself through the head. Hudson was appointed GSK’s World Safety Officer in 1999. His department was responsible for adverse events that were sent in by health professionals and members of the public. Whilst under oath Hudson told Andy Vickery, attorney for Tobin, about his role in reviewing the link between Paxil and aggression. Hudson was then asked by Vickery what he intended to do with the report once it was finalised, adding; Do you intend to submit it to any governmental agency? This doesn’t really install confidence in informed consent. If Hudson was back then stating that his findings would not be reported to the drug regulator then one can only assume that he still holds the belief that pharmaceutical companies are entitled to hold on to information that could endanger the public. information that implies that there is a correlation between low levels of serotonin or 5-HIAA in patients’ suicidal activity. Hudson’s deposition can be viewed in full here. Now Ian Hudson is the head honcho at the MHRA. If you take the time to read the complete deposition of Hudson you will see how he [whether under instruction or not] clearly deflects the blame of suicide and aggression onto other ‘factors’ rather than implicating Paxil. And now this guy is in charge of regulating medicines in the UK. 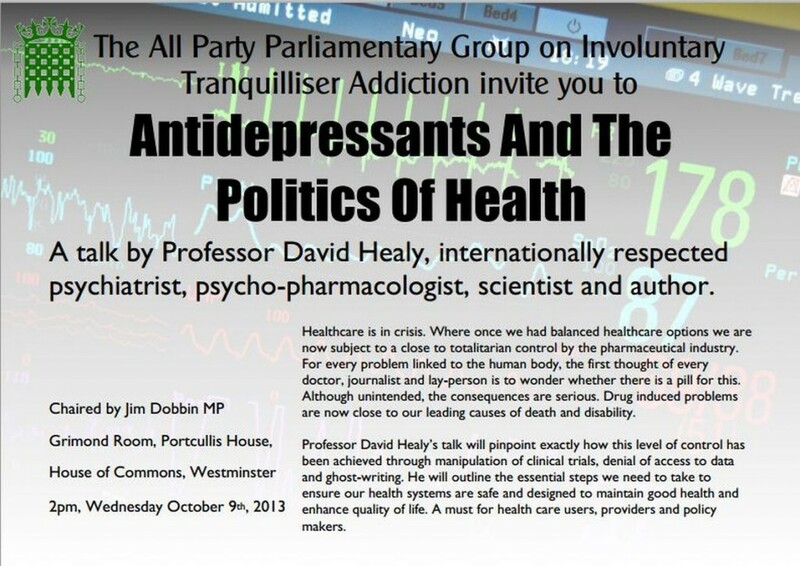 Do you think his presence will alter the MHRA’s stance on the safety and efficacy of SSRi type medications? Well, I have seen no evidence to suggest that at all.